When a 14-inch share is finished the point, from the joint of the share to the extreme end of the point, should be II inches, not longer, and for a I6-inch lay, 12 inches, not longer. 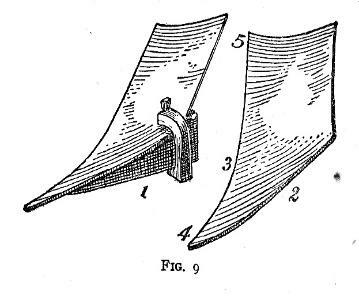 The point acts as a lever on the plow, and if it is too long the plow will not work good, and it is liable to break. Shape the point so that when you hold it up against the plow it will be in line with the bottom of the landside, but about half an inch wider than the landside to weld on. If it is a plow where the point of the mould board rests on the landside point, and it is a double shin, then cut out in the land~de point for the point of the mould board to rest in. See No. I, Figure 9. This will be a guide for you when welding the share, and it will slip onto the plow easier when you come to fit it to the same. I think enough has been said about the landside to give the beginner a good idea of how to make one. And if the landside is right, it comes easier to do the rest. In making a plowshare there are many things to remember and one must be on the alert right along, for it will give lots of trouble if any point is overlooked. We will now weld a share to a long bar landside. The landside having been finished and bolted to the beam or its foot, or to a standard, the share is to be shaped to fit. Hold the share up to the plow. First look if the angle for the point is right in the share; if not, heat the share, and if under the angle wanted upset up at the joint; if over the angle wanted, drive it back at the point. In doing this hold the edge of the share over a wooden block instead of the anvil, so as not to batter the thin edge of the share. If the share has been upset so that it has a narrow rib along the point where it is to be welded, draw this down and make it level. In most blank shares the point should be raised to fit the landside point, so that when the same is placed on the floor the edge of the share will follow the floor or leveling block (if you have it), from the heel right up to the point, then it will be easy to make the edge come down to the square in finishing it up. If this is not done the edge of the share from the throat back will generally be too high.